and any space that has reverberation problems. Architectural Noise Control products include; acoustical wall panels, ceiling tiles, ceiling baffles, acoustic banners, diffusers and noise barriers. We also offer Metal panels, ceiling tiles and clouds, those comes both in metal and fabric options. Our engineered noise control solutions provide noise control solutions to meet all commercial and interior soundproofing needs. Classroom design and layouts with good acoustics help students understand what educators are teaching and allows students to have a better understanding of the lessons with fewer distractions. Proper design and layout in a classroom environment will add acoustical wall panels or acoustical ceiling tiles to break up the hard wall and ceiling surfaces used in typical classroom environment. Recording Studios in a commercial or home recording studio, a broadcast studio, or a production room in a church, requires low noise from the mechanical equipment, solated room from outside noise and good space acoustic control. This type of acoustic need requires special attention and knowledge to the nuances of voluminous spaces & hard surfaces, especially in the new architectural designs. This excessive space allows for significant reverberation, also known as echoes. In today’s built environment noise problems can range from being a mild nuisance to a serious intrusion in another space. Acoustic problems in schools may cause difficulties with teaching, as students can’t always hear what is being said and this affects concentration (and therefore academic performance). Or poor auditorium acoustics may spoil the enjoyment of a concert. Whatever the source of noise or problem being experienced, the first step is to identify what the problem is and how we can resolve it. Proper restaurant design and layout should take into consideration what the room will sound like. Acoustical materials are used in restaurant interior design to create a quieter environment for a better dining experience. Acoustical wall panels or ceiling tiles can be used in restaurant interior design to create a more pleasurable and comfortable atmosphere or ambience. These acoustical treatments are not only effective, but aesthetically pleasing. Froggtown Inn & Acres Restaurant keeps things aesthetic and quiet with our ceiling clouds. Read More. Clean room environments impose sanitation constraints diametrically opposed to the basic construction of noise control materials and systems. Clean rooms require washable, cleanable, dust and fiber free supply materials. Clean rooms usually are designed with hard and reflective floor and wall treatments, which create a high level of reverberation or echo leading to poor speech intelligetability within the clean room. Acoustical Wall and Ceiling Panels are fabric wrapped fiberglass panels designed to absorb sound. They are all custom made to enhance both the acoustical experience and aesthetic appearance of your space. Sound diffusers are designed to scatter or disperse sound, by using irregular hard surfaces to break up and scatter the sound waves throughout your space. Ceiling Tiles are fiberglass tiles that can offer both sound absorption as well as sound blocking capabilities with NRC ratings as high as 1.15 and STC ratings as high as 26. Barrier is a flexible mass loaded vinyl that is designed to reduce the passage of sound through walls, ceilings, and floors. ANC offers a wide range of acoustical ceiling treatment including light weight clouds, baffles and banners in a variety of finishes such as Fabric, PVC and Sailcloth. 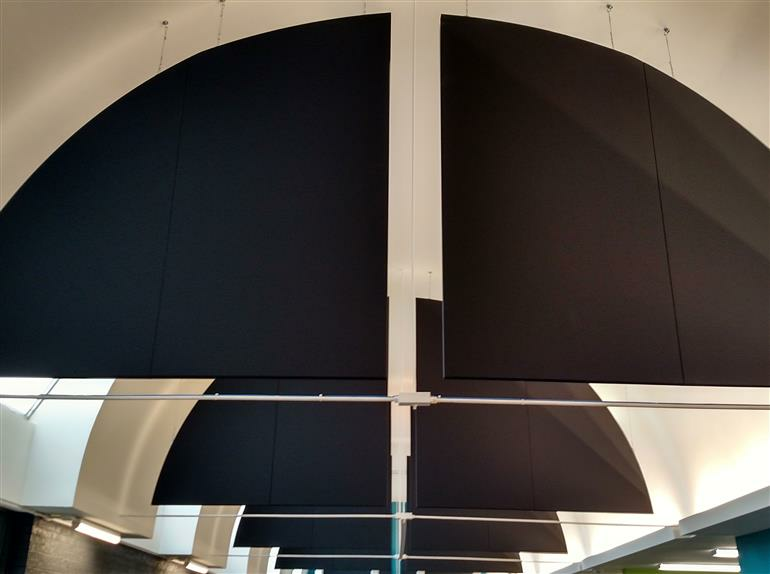 Sound absorption ceiling multipurpose baffles are lightweight ceiling baffles and banners you can create unlimited architectural effects that improve sound quality as well as the spaces aesthetics resulting in an ideal acoustical environment. Suspended acoustic treatments which are highly effective in in absorbing and reducing sound problems in various ceiling areas. Various edge finishing details with custom sizes and shapes available. Call us today to discuss your options. Commercial Ceiling Clouds is free-hanging fiberglass ceiling panel. It offers a high-recycled content (71% total, 70% post-consumer, 1% pre-consumer). The LEED calculation for this products recycled content is 71%. The acoustical performance of this product may contribute to points for a LEED project per that U.S. Green Building Council system. Noise Absorbing ceiling tiles are top-performers, cost-effective and of the utmost quality acoustic ceiling tiles available. Perfect for commercial and corporate environments to control noise within an area and help prevent it from traveling from space to space. Both our melamine and standard ceiling tiles are available for quick delivery and a cost effective solution for virtually any ceiling!